We stayed at the cabin on the lake for 4 nights over new year 2014 and wanted to share our experience of being in the cabin over winter as we had a wonderful time, and we think future guests will have equally amazing stay if they choose to visit in winter. It was such a relaxing stay, being beside the lake and so close to nature. Being cut off from the TV, computer and, whilst inside the cabin, mobile phones, meant you could really relax, enjoy the beautiful surroundings and get stuck into a good book! We had a wonderful stay due to going prepared and having read-up on Gwalia website about the facilities and what to expect. 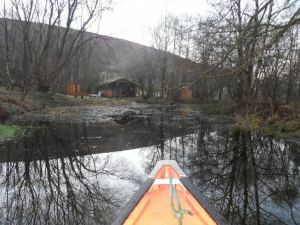 The website really does try and give you a flavour of what the cabin is like, with the photos and also the very clear information from Dee and Amy. We knew it would be cold, and that the weather might be bad, so we simply packed accordingly. Lots of thermal socks, vests, waterproofs, gloves, wellies etc.! We had our main meal of the day at lunchtime whilst out and about, and then we bought provisions in the local supermarket for a simple dinner at the cabin in the evening. 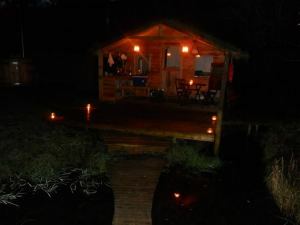 Eating a sausage sandwich or tucking into a warm bowl of soup with crusty bread, whilst sitting out on the decking lit by tea lights, was the perfect end to our busy days of walking and adventure! A lovely log burner inside the cabin so we were never cold. Plenty of wood to keep the log burner going through the evening. Plenty of warm bedding and blankets provided to ensure you were never cold. Blankets meant you could sit outside in the evening with them wrapped around you. Paraffin lamps meant plenty of light in the evenings outside on the decking. The torches and battery light bulbs meant we could read inside the cabin. Lots of tea light lanterns to light up the outdoor area beautifully in an evening. The hot tub was brilliant! What a wonderful experience to be in a warm hot tub at night time, with the stars twinkling in the sky above you. Being wintertime, it took us a few hours to get the water up to temperature on our first evening, however, the following nights didn’t need so long as the water had retained some warmth. Anyway, it gives you something to look forward to! Composting toilet was absolutely fine (to be honest, much nicer than any portaloos or public toilets!!) Nice to have a natural fragrance spray inside the toilet hut just to keep things smelling fresh whilst you were inside. I loved the heart-shaped window cut into the door so you could look out at the lake. Having the canoe was great fun to explore the lake. 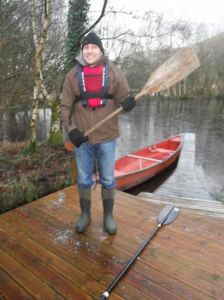 We certainly enjoyed having a paddle! Super range of resources in the kitchen to cater for your cooking needs (the website explains what is supplied so you have a good idea what to expect prior to arrival). The outdoor sink for washing up the dishes and washing yourself was tucked around the side of the cabin. Yes, the water was cold coming out of it in winter as it came from the natural spring. However, all you had to do was boil the kettle. We tried all the methods of showering! Dee and Amy kindly let us use their indoor shower at the farmhouse. We also used the pump up shower, although the low pressure (well we are all used to power showers nowadays!) meant in winter it was a rather chilly shower experience. Our final shower was using hot water from the hot tub in our bucket, which worked brilliantly and definitely worked better for us than the pump-up shower. This was a very invigorating wash outside on the decking and finished off perfectly but jumping into the hot tub afterwards! The warmth from the log burner in the cabin meant clothes and towels dried very quickly! Lots of thoughtful touches to the cabin, such as providing a compact mirror, mulled wine and mince pies on arrival, binoculars and nature books provided. Being winter it was cold enough outside so we didn’t need to use the natural fridge! We would absolutely recommend visiting the cabin in winter. I have no doubt future guests will also have a beautiful and peaceful stay. Just use your common sense! Go prepared for a simpler way of life and pack plenty of thermals! This entry was posted in Cabin on the Lake on January 26, 2015 by Dee.